Crunchy, sweet and juicy, green seedless grapes satisfy a multitude of cravings, which may be why Americans like them so much. On average, Americans eat 8 pounds of grapes a year, according to the College of Agriculture and Life Sciences at the University of Arizona. Nutritionally, green grapes offer a number of health benefits, so keep on eating. With 104 calories per 1-cup serving, green grapes make a healthy and natural low-calorie snack. Most Americans eat too many calories, according to the U.S. Department of Agriculture. The 1-cup serving of green grapes fills you up and satisfies hunger, which helps keep overall calories -- and ultimately weight -- under control. Grapes contain a substance called resveratrol, which is a natural compound that protects the fruit from environmental stress, fungal infections and ultraviolet radiation. Resveratrol also works to protect human health. As an antioxidant, it may protect your cells from free-radical damage and lower your risk of heart disease by preventing blood clots and reducing inflammation. The resveratrol in green seedless grapes may also prevent the growth of cancer cells. Carbohydrates are an important part of your diet. In fact, nutritionists recommend that 45 to 60 percent of your calories come from carbohydrates. But most of these carbohydrates should come from healthy sources that provide fiber and essential vitamins and minerals in addition to the carbs. Green grapes fit the bill as a healthy carbohydrate. A 1-cup serving contains 27 grams of healthy carbs and 1.4 grams of fiber. 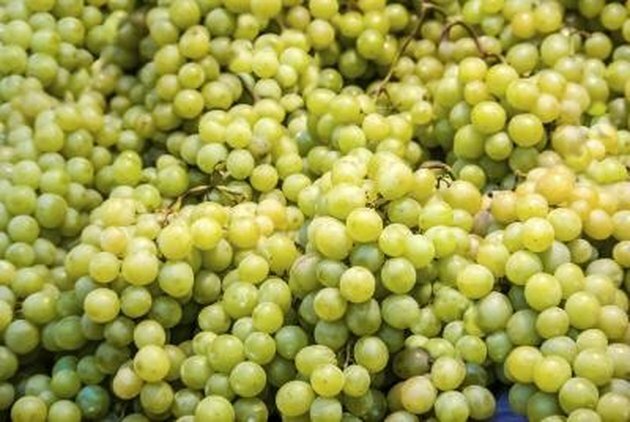 Green grapes also supply a healthy dose of important minerals, also known as electrolytes. This mineral combo is responsible for maintaining fluid balance and the proper acidity of your blood; electrolytes are also important for muscle function. Eating green grapes is a good way to replenish electrolytes after strenuous workouts. A 1-cup serving of green grapes contains 15 milligrams of calcium, 11 milligrams of magnesium, 288 milligrams of potassium and 30 milligrams of phosphorus. Green seedless grapes can help you meet your vitamins A, C and K needs. One cup of grapes provides 100 international units of vitamin A, 4.8 milligrams of vitamin C and 22 micrograms of vitamin K. Vitamin A helps your body fight off infection by boosting your immune system. Vitamin C is important for healthy gums and muscles and also helps wounds to heal. And finally, vitamin K is essential for blood clotting.